The restoration of the Seth Thomas tower clock movement, from the clock tower above the horse arena at the Longview Farm. 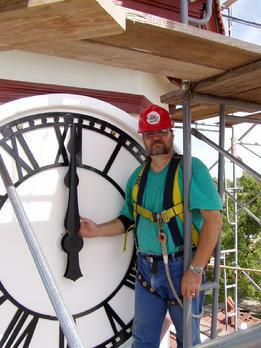 On May 14th 2004 we disassembled and lowered out piece by piece the tower clock movement. 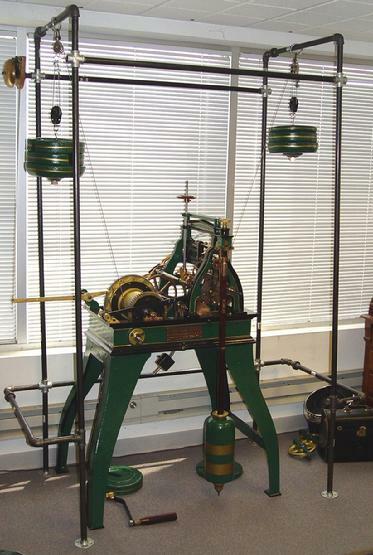 The 1914 clock movement will eventually be on display running. The horse arena was converted into a Lees Summit elemtary school. Complete renovations and additions to the school are now complete. 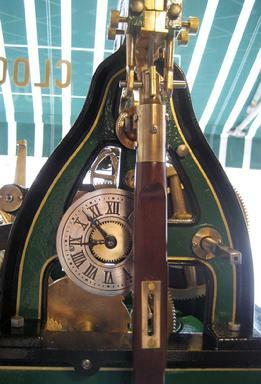 I also restored the four 1914 clock dials on the clock tower. And replaced the old clock movement with four state of the art computerized clock movements. The Seth Thomas Company in Thomaston, Connecticut, manufactured the Longview Farms tower clock between 1913 and 1914. In the language of clockmakers, its design is described as a manual rewind, four dials, weight driven, time and strike clock with a deadbeat anchor escapement. The clock is powered by the force of 120 pounds of suspended weight attached to the clockworks by a mechanism of pulleys and a #40 roller chain. 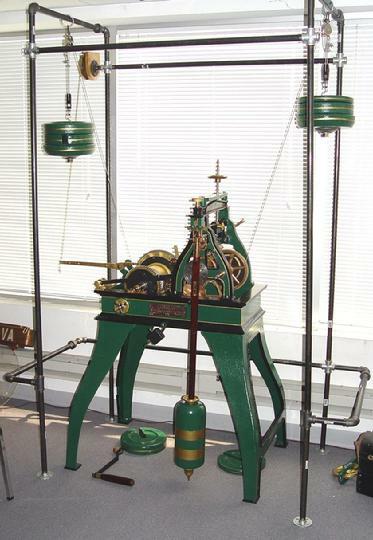 A pendulum 40 inches long, weighing 92 pounds, regulates the pace of the clock at one beat per second. An electric rewind motor utilizing a 40:1 gear reduction that turns at six revolutions per minute replaces the original rewind hand crank. The clock strikes on the hour. The strike mechanism is powered by 300 pounds of suspended weight attached to the strike works by a cable and a series of pulleys. The chime is a bell 60 in. tall and 60 in. wide, weighing 1000 pounds. Like the clockworks, the strike drive rewind crank has been replaced with an electric motor. Click on any picture below to supersize and see every detail. CLICK HERE TOWER CLOCKS TO VEW THE RESTORTATION OF LONGVIEW'S CLOCK TOWER. THE LONGVIEW TOWER CLOCK MOVEMENT WAS IN THE CLOCK SHOP'S DISPLAY WINDOW RUNNING ON TIME FROM MARCH 25th 2007 to MARCH 19th 2010. THE SETH THOMAS TOWER CLOCK MOVEMENT WAS SOLD ON EBAY MARCH 5th 2010 FOR $14,000.00 AND NOW HAS A NEW HOME AT A CLOCK SHOP IN RACINE WISCONSIN.